I could go on and on about how beautiful, tranquil, pleasant and peaceful the Almyra Hotel is, about its luxurious Kyma suites by the sea with comfortable, private sun-beds, and definitely about their high quality Spa right by the adults-only pool and the healthy-style restaurant right next to it. Nevertheless, I will assume that most of the people w ho read this have visited it at least once for coffee or a drink. If you haven’t been, it is about time you go. 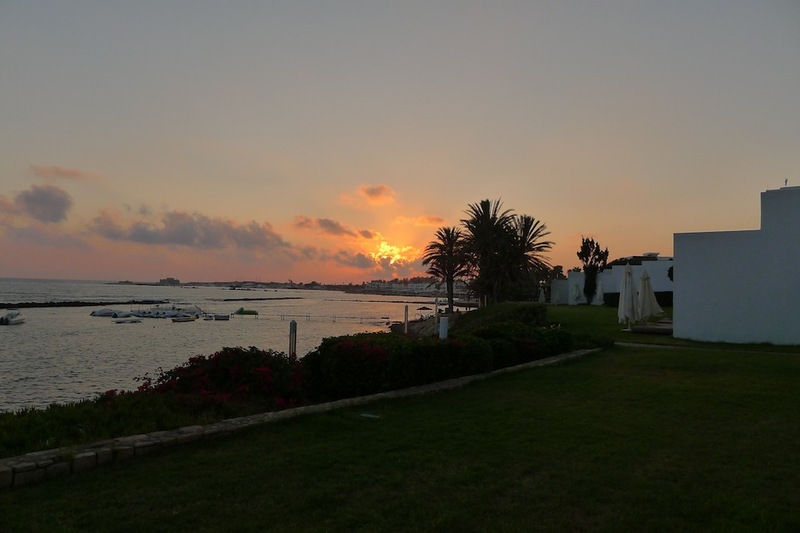 Apart from its modern decoration what makes it different is that, unlike hotels around Protaras/Ayia Napa area, Almyra makes you feel like you are in a secluded resort surrounded by exotic greenery and the Mediterranean sea. In any case, instead of describing the hotel facilities, I would like to share my evening dining experience. The truth is I knew quality would be high (as one would expect looking at the owners’ track record with Annabelle and Anassa hotels), but I actually thought their restaurant services were limited to the Ouzeri by the sea and their pool-side restaurant that has an international menu. Little did I know that my dinner would be a 5-course tasting menu with an assortment of wine glasses by an ex Nobu English/Canadian chef who lived in Japan for 10 years. The tasting-menu, also called Omakase menu (which means “trust the chef”), was prepared according to our liking after checking our dietary preferences via email the day before. It w as served at the pool-side restaurant which, at night, transforms itself into an elegant patio with a magnificent view of the Kato Paphos bay lights reflecting in the sea. 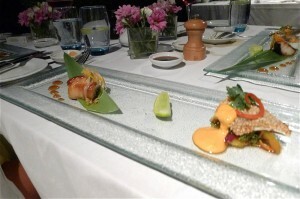 Calling it a 5-course would be wrong I think, as each dish had more than one “course” in it. The first to arrive were two well-presented amuse bouches with fresh local ingredients to prepare our pallette of what would come. 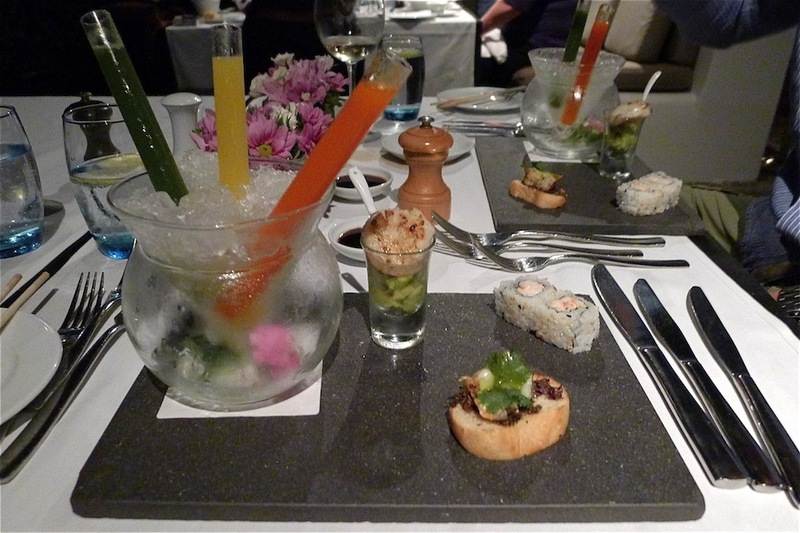 The first proper course was a selection of 3 types of Japanese soup served beautifully in test tubes. They were mild in taste and went perfectly with the savoury and slightly s weet lobster tapenade crostini, the seared scallop and avocado and two pieces of crab uramaki sushi that gave the dish a Japanese flair. The fact that we had no idea of what was to follow was actually fun as we spent most of our in-between-courses time guessing what would follow. 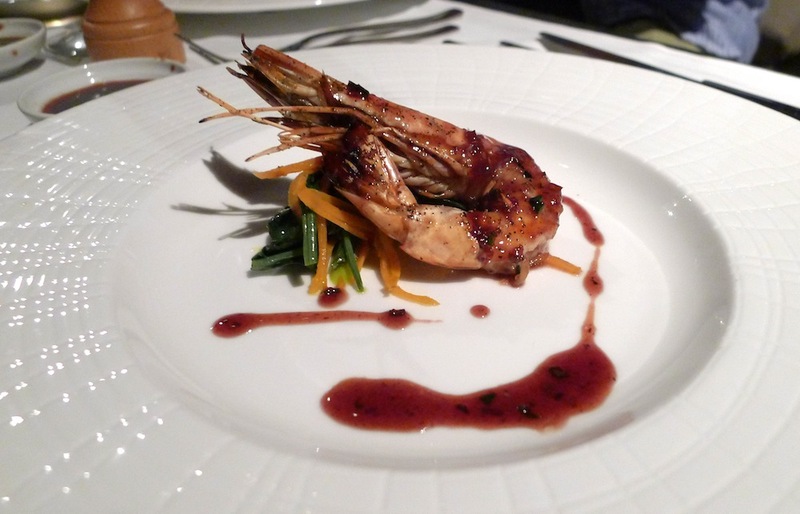 Prawns were part of our guess, but not a the black tiger prawn with chilli vanilla glaze. I like vanilla in sweets but I never thought I would like it with prawn. I can’t say it was mild, but rather strong in a good way as it was balanced out with the salty spinach and carrot noodles. Having ruled out the prawn as a main course the stakes went to grilled fish, probably cod. 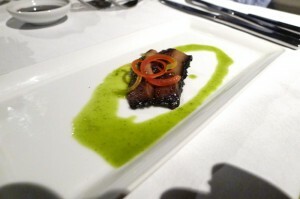 When the black cod arrived as a 3rd course together with a sea bream fillet we were out of options. This was my personal favourite dish as the sweet miso roasted black cod that melted at the first bite and was simply devine, so was the crispy sesame sea bream with chilli pesto that came with it. 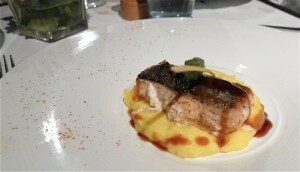 The main course was indeed a fish course: grilled salmon with asparagus. When I saw it I immediately thought it was a bit boring as I usually consider salmon to be diet food. That was before I tasted it. The saffron mash and the anise teriyaki sauce that came with it gave it an entirely different taste making it slightly sweet but not overbearing. Right when I thought I would need way more than 4 small courses, I was full and ready for dessert. It is as if the chef knows when to stop, even though we don’t, leading us to over-order and hence, over-eat. For dessert we guessed sorbets and Japanese crème brulee. We were only pa rtly right as no-one out of the three proud Cypriots could guess that a 7-sided dessert would come. The three “frozen heavens” were divine with the refreshing pistachio and ginger sorbet winning the top prize, and the sweet and lemony Thai Kaffir Lime leaf ice cream winning the second prize. 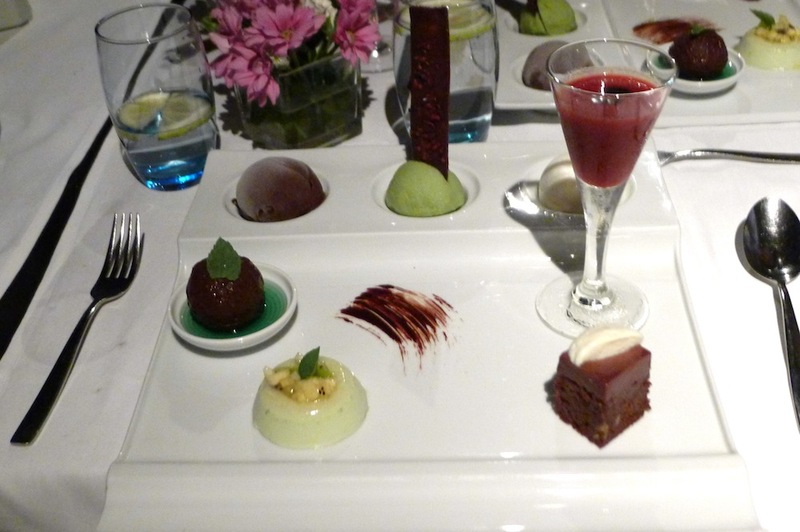 The rich and moist dark chocolate brownie was at the top of the list as well, while the mint chocolate sphere, when removed from green syrup at the bottom that reminded me of cough medicine, was surprisingly good (this coming from someone who hates mint). My least favourite was the summer berry gazpacho with a touch of tomato that I thought was a bit too strong, and the lemongrass pannacotta with Asian fruite compote that I thought was too plain. As there were 7 choices on your dessert plate however, I didn’t mind at all! There are not a lot of places in Cyprus where one can enjoy a dinner at this level of quality, both in terms of service and quality. What I really liked is that the chef used a lot of local ingredients as well as exotic ones to prepare an interesting meal. The 72€ cost of the Omakase menu might hurt at first, but before complaining one should think where they are, what kind of view they get to see, what kind of service they get to enjoy and what kind of culinary encounter they get to experience.